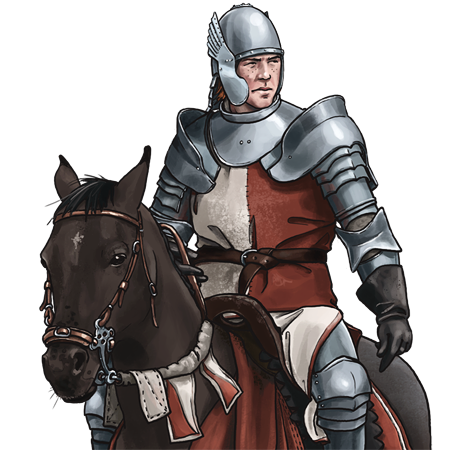 A squire who survives many fierce battles is granted the honor of knighthood. At this time the knight receives a steed he must care after at all times. The Hospitalers are iron-willed sword-brethren who receive an swift steed and specialize in healing. Functioning in a combat-medic role, using their horses they can relocate quickly on the battlefield to reach injured troops. Their duty has an grim aspect however, as should the sword-brother be injured beyond salvation, the Hospitaler must ensure the undead cannot make use of the resulting corpse. To that end, the Hospitaler uses an incendiary powder made by the alchemists of the order, the powder when administered ignites upon contact to dead flesh, the resulting fire swiftly consuming the corpse. Many an former friend and colleague had to be burned as the toll of seeing them shambling among the enemy ranks would be too great. Still, many more brethren than they had to burn has been saved thanks to their valiant efforts. Special Notes: This unit is capable of basic healing. This unit has a defense cap on certain terrain types — it cannot achieve a higher defense rating on mixed terrains with such terrain types.